Inter Board Committee of Chairmen (IBCC) has taken an initiative of providing online facility of attestation, verification and equivalence of secondary, higher secondary level certificates and diplomas. 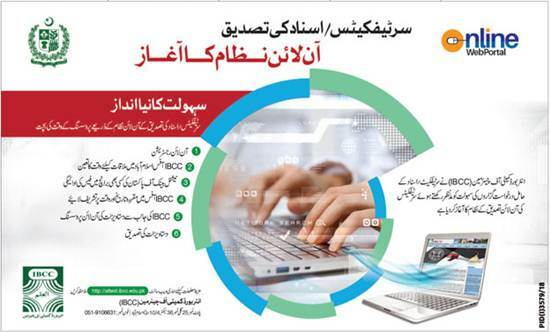 You can now get attestation/ verification of matric and intermediate certificates issued by any Board of Intermediate and Secondary Education of Pakistan. Diplomas and certificates issued by any Technical Board of Pakistan can also be attested and verified online on IBCC website. Attestation of certificates and diplomas, issued by the Boards of Intermediate and Secondary Education and Boards of Technical Education in Pakistan, is very important for those candidates who want to go abroad for further/higher education and /or for employment purposes. So you can easily get online attestation of matric and intermediate certificates and Diploma of Associate Engineer and other technical certificates issued by technical boards. IBCC also grants equivalence to foreign qualifications with corresponding Pakistani Certificates at the Secondary School Certificate (SSC) (Matriculation), Higher Secondary School Certificate (HSSC) (Intermediate levels) and technical education as well as other certificates / diplomas with the comparable certificates awarded by the Boards. IBCC also converts foreign grades into Pakistani marks at SSC/HSSC level. GCE ‘O’ Level, GCSE, IGCSE and Equivalent: GCE ‘O’ Level is generally considered equivalent to Secondary School Certificate (SSC) subject to meeting the specified requirements. GCE ‘A’ Level: ‘A’ level is generally considered equivalent to Higher Secondary School Certificate HSSC/ Intermediate) subject to meeting the specified requirements. You can also get equivalence certificates issued by American, Canadian and other education systems. There are some specified rules of IBCC for marks and grades conversion. Online attestation, verification and equivalence can be obtained at IBCC Online Attestation Portal.